When the tool engages tough obstructions‚ the 115V motor slows while power builds. This is apparent as visual and audible signals indicate the torque builds. The inner-drum and ball-bearing distributor arm works with the motor/gearbox system to reduce the chance of cable flip-over. 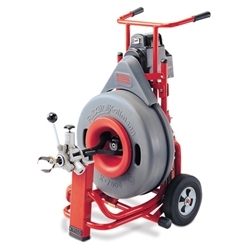 The powerful feed mechanism has grease fittings and an open design for easy maintenance. The power feed advances and retrieves cable up to 22 feet per minute. The inner-drum won’t rust or dent‚ and is easily cleaned. Drum holds 100 ft of 3/4" or 125 ft of 5/8" cable. Includes: 3/4" x 100 cable‚ tool set‚ tool box‚ leather gloves and hex key.